What did the MHSc give you? The degree honed my skills in study design and statistics, allowing me to form studies that are more scientifically sound. What advice to you have for current students and recent graduates? The MHSc is valuable in many fields, you can use the skillset anywhere, and expand. It’s completely doable to balance your clinical work and the Masters workload. The surgical treatment I use for removing facial tumours is inspired by the mummification process in Ancient Egypt. Andrew Thamboo does not drink coffee, so he gets through his clinical days at Stanford University’s Sinus Center, seeing 30 to 40 patients daily, on pure enthusiasm. Dr. Thamboo graduated from the University of British Columbia (UBC) residency program in 2015, and completed his Master of Health Science (MHSc) at the School of Population and Public Health in 2013. 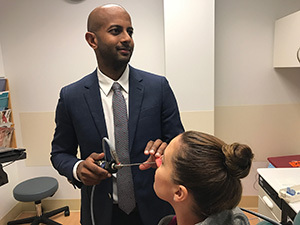 He completed a head and neck surgical residency, and followed this interest to his current role as a Clinical Instructor in Stanford’s Division of Rhinology and Endoscopic Skull Base Surgery. improved outcomes compared with historical methods of removing tumours via incisions on the face, including less recovery time required for patients, and less trauma, Dr. Thamboo says. As well as teaching residents, his work at Stanford also involves research, including one project analyzing patient outcomes of the treatment for a rare condition called ‘Empty nose syndrome’, where patients with clear nasal passages commonly feel as though their nose is blocked, dry, or they feel unable to breathe. The MHSc helped to hone these research skills, he says, teaching the ability to interpret data and form meaningful conclusions, conduct sound studies, and communicate with seasoned statisticians. Many academic programs look for people to contribute to the literature, producing high quality research while having a clinical background, Dr. Thamboo says. The degree allows graduates to work in many fields, including medicine, business, and economics. Dr. Thamboo is set take up a post as an assistant professor with UBC’s Faculty of Medicine in the Department of Surgery, with clinical work performed in Vancouver General Hospital and St Paul’s Hospital, working in this otolaryngology sub-specialty, rhinology and skull base surgery, a role he says is one of the most coveted in Vancouver. His memories from the program include the “game changing” Mike Marin, who made the complicated subject of statistics understandable, and Professors Aslam Anis and Jane Buxton’s classes.